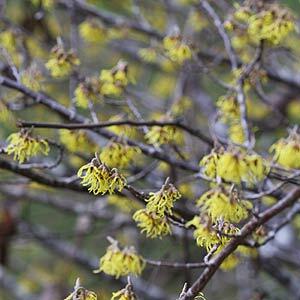 Hamamelis or ‘witch hazel’ are an easy plant to grow. Well drained, soil, light shade and some protection from wind. These plants form a medium to large shrub and will give good colour in the autumn. Hamamelis x intermedia ‘Arnold promise’ has bright yellow flowers on a compact bush. This is the Chinese Witch Hazel, red and yellow flowers on bare stems in late winter make a wonderful display. Attractive rounded green foliage from spring through to autumn reaching around 3m. 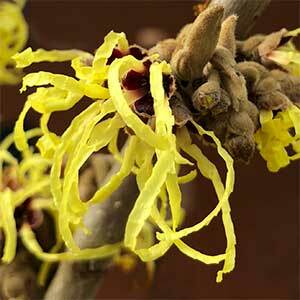 From North America this is the American Witch Hazel has yellow flowers and is widely used in cosmetics as a skin lotion. Can reach to 7m and more, usually less. Hybridisation has given the Witch Hazel plant a new lease of life, these hybrids are called Hamamelis x intermedia and a number of garden worthy cultivars are available. ‘Jelena’ – Fragrant flowers with coppery tones. ‘Pallida’ – Highly regarded, very fragrant flowers, a good yellow in colour with crinkled or crimped petals. ‘Arnolds Promise’ – An Australian developed cultivar, a compact growers, yellow flowers and good autumn colour. ‘Ruby Glow – Deep Orange to Red flowers. ‘Diane’ – Orange to Red flowering. As long as the soil is not heavy clay, these modern Witch Hazel plants are happy. They do perform best in a humus rich well drained soil, and a layer of mulch to maintain a cool root run is a good idea. They are an early flowering plant and add color to the garden in early spring. Look for other varieties such as, H. mollis Pallida with perfumed straw yellow flowers on bare stems and golden autumn color. Hamamelis vernalis ‘Sandra’ which is the Ozark Witch Hazel with orange autumn tones purple new foliage, and H. virginiana is more of a small tree with pale yellow flowers.